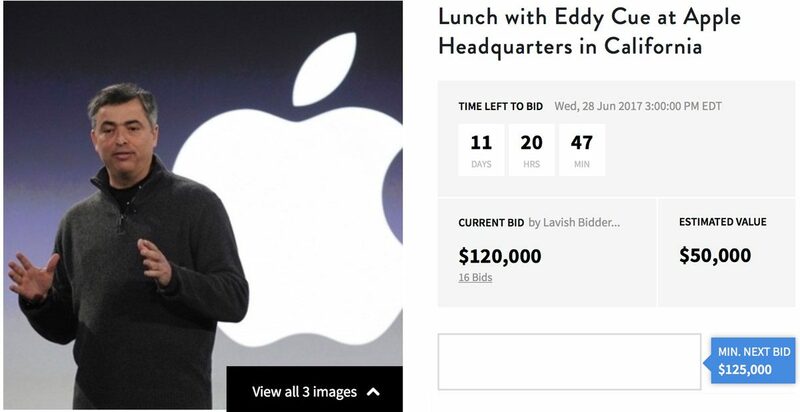 Apple Senior Vice President Eddy Cue is offering himself up for a charity auction. Similar to charity auctions by Apple CEO Tim Cook, Mr. Cue is offering a personal meeting with himself at Apple Park. The auction had already topped $120,000 with 11 days and 20 hours to go. Proceeds from the auction will benefit the National Association of Basketball Coaches Foundation. Mr. Cue is an avid basketball fan, and this organization is involved in education, literacy programs, and other charitable efforts. Time with Apple executives probably falls somewhere on the coveted end of the desirability scale, and these auctions have raised a ton of money for charity. Tim Cook’s auction in May, for instance, closed at $680,000. Here’s your chance to have lunch with Eddy Cue at the stunning new 175-acre Apple Headquarters in Cupertino, CA, where you will learn more about Apple’s industry-leading content stores and online services. This is a rare opportunity to see “Apple Park” and engage in a one-on-one, in-depth conversation with one of the most innovative business minds of our generation. The winning bidder gets lunch with Mr. Cue at Apple Park. If you want to bid, pack your wallet: as of this writing bidding increments are up to $5,000.